Review: These days, gaming in general has gotten... softer. In the olden days, part of the fun of gaming was finally getting past a tough opponent, or solving a difficult puzzle that had been giving you problems for some time. What we need is a game that isn’t afraid to hearken back to the old days, and give a taste of what we’ve been missing. That, more or less, is the introduction from the manual of an independent game called La Mulana. 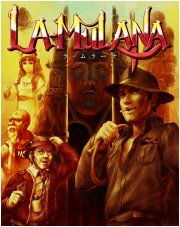 Therein, you control Lemeza Kosugi, the whip-wielding Indiana Jones-esque archaeologist who has taken it upon himself to solve the mystery of La Mulana after receiving a note from his dad claiming that he is about to do the same. And after a short trip, Lemeza arrives at the entrance to the ruins, armed only with his trusty whip and his determination to beat his dad at uncovering the truth behind these ancient ruins. Isn’t that the perfect pitch for an old-school game? Imagine it: a son who is prepared to lose his life to a cave filled with monsters and traps, all to show up his old man. Back in the day, nobody cared about a story that didn’t make all that much sense. It was all about the gameplay, and in that regard, La Mulana is seriously old school. Maybe even a bit too old school. In the manual, the developers explain that they’ve built their game with the intent of creating “tension”. To wit, there are no health powerups in the game; to refill your health, you need to either save and reload your game, or fill your EXP bar by killing monsters. You don’t actually gain levels, rather completely filling the bar simply refills your health. Individually, the enemies don’t do that much damage, but the other way to lose health is by traps, ranging from simple spikes to “sacred” objects that, if accidentally struck, will smite you with a highly damaging bolt of lightning. But those are the easy ones. The game has a reputation for its difficulty, and for my money, almost all of that difficulty stems from the puzzles you have to solve. A few of the puzzles are as simple as killing all the enemies on the screen to open a treasure chests. The majority, however, involve making sense of riddles written on tablets spread throughout the game world. These are not easy riddles, people. These are the kind of puzzles where you find out the answer and go “huh... okay.” In particular, many of the hints listed on the tablets are so strangely worded that you’ll think the translators were messing with you. The rest of the puzzles involve experimentation. Very careful experimentation. The difficult puzzles I could deal with. My biggest complaints lay with the one-time puzzles. There are a handful of puzzles that, if you mess up a single step, will become permanently unsolvable. I understand that the developers wanted to create a sense of tension by making the player worry about the consequences, but this seems a bit harsh, even for old school gamers. But among those one-time puzzles is an even more sinister puzzle: In the game, there are a few puzzles and traps that, if performed improperly, will leave you unable to complete the game. You read that correctly. Most are designed simply to trap you in a room, forcing you to reload or use a special item to teleport, but the others will block your progress in such a way that you may not even realize what has happened until it’s too late. Case in point: in one room, you must activate a switch to drop a large block onto a platform to use as a giant stepping stone. Should you set foot on that platform without the block on it, however, it will disintegrate, and you will be permanently unable to reach the ledge you needed to reach. Again, I understand what the developers wanted to do, but there is a reason game testers consider progression-stopping events to be the kings of all bugs. Daunting difficulty and a steep learning curve aren’t the only old school aspects of the game. As one commentator remarked, the game is essentially a love letter to the MSX, the home computer system that didn’t see a whole lot of play outside of Japan. Lemeza uses one of own to manage items, including MSX game roms, that he finds in the ruins. Most notably, you’ll use one rom to save your game and another to decode the various writings you’ll find within the ruins. Once you have enough money, you can even buy a more advanced MSX that can combine two roms at once, providing you beneficial effects, such as enhanced weapon damage, or less useful effects, like causing you to die after a single hit. If it sounds like I’m coming down on the game, it’s only because of the difficulty. Having beaten the game myself, I have to confess that I spent about 30% of my time looking up answers to some of the more obscure puzzles in an FAQ. Doing so does lessen the achievement factor of getting through everything, but you still have to contend with some tricky boss fights that wouldn’t seem out of place in a standard action game. And the music, oh the music. It’s a wonderfully old school soundtrack that you’ll want to listen to outside of the game. It made the repeated backtracking needed to find an item or drum up some cash that much more bearable. Sometime this winter, you’ll see a Wiiware remake of the game. Personally, I don’t know how well that will go. For starters, the MSX references have been more or less changed to PC ones. This isn’t necessarily bad news, as I wasn’t too impressed with all the regular enemies in the game looking like sprites from the Atari 2600. Still, the overall style of the game was pretty closely tied to the MSX. It’ll be interesting to see if it still works without it. More importantly, though, I don’t know that the game will go over well with Wii owners. The developers talk about being tired of modern gamers having it easy, and that’s who they’ll be targeting. To put it simply, La Mulana is a game that simultaneously rewards and punishes exploration. It’s a game that presents the player with puzzles that require a level of abstract thinking that borders on schizophrenia. I’m not saying it absolutely will fail to capture a wide audience on the Wii. Maybe it will lead to renewed interest in games that are simple to make and fun to play, with enough challenge to keep players from getting too soft. Or maybe Wii owners will shun La Mulana the way Boston shunned Hester Prynne. Only time will tell. I had read about this in Nintendo Power. It looks really fun and definatley worth a download for Wii. Yeah, you can get it in just about any store. Sounds like a tough one. When did this game come out? It should do well on the wii. Mega Man 9 did suprisingly well and it is the hardest game released in a long time. Or at least it is "apparently" as I beat the stupid thing and I was NEVER any good at mega man games. Of course I was 10 when they were popular so that might have had something to do with it. That is true. MM9 does break your balls quite a bit, but damned if I didn't buy it, too. But I think the reason La Mulana might do worse that MM9 is because it doesn't have that same fanbase, and the difficulty lies in the complex puzzles rather than tricky combat/platforming.